In her Wheeler House office, one wall lined with books on the Holocaust and twentieth-century German history, another with a panoramic map of the Alps from the perspective of her native Munich, Susanna Schrafstetter considers the University of Vermont legacy of the late Professor Emeritus Raul Hilberg. Alan Steinweis, professor of history and former director of the Miller Center, notes the fundamental challenge that Hilberg, professor at UVM from 1956 to 1991, undertook when, as a graduate student, he launched his research on the Holocaust. Citing Hilberg’s memoir, Politics of History, Steinweis shares Hilberg’s recollection of his Columbia doctoral dissertation advisor telling him that the subject would be his professional death. 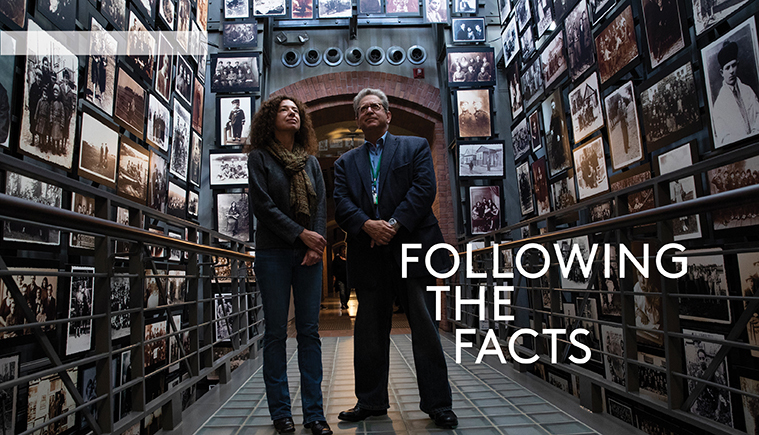 “It’s not that people were in denial about what happened to the Jews in Nazi Germany in World War II,” Steinweis says. That all changed in 1961 with Hilberg’s publication of The Destruction of the European Jews, a foundational work exhaustively documenting the Holocaust with a rigor and authenticity never before approached. A measure of the global impact of the career that followed is found in an October 2017 conference in Berlin, co-sponsored by UVM’s Miller Center, that brought together many of the world’s top historians and Holocaust scholars to consider Hilberg’s transformative work on the tenth anniversary of his death. At UVM today, Steinweis calls Hilberg’s impact “palpable,” with a professorship, lecture, and research collection named in his honor. But the greatest tribute to his influence is found in the work of the current generation of Holocaust scholars at UVM. Academic focuses vary—history, political science, religion, German, sociology—but faculty are united by an approach to their scholarship that follows in Hilberg’s footsteps, Steinweis notes. Last fall, Steinweis and Schrafstetter, a married couple who came to UVM in 2009 from the University of Nebraska, received prestigious research fellowships from the Jack, Joseph and Morton Mandel Center for Advanced Holocaust Studies of the U.S. Holocaust Memorial Museum. The honor gave them the opportunity to spend the semester in Washington, D.C., writing and using the museum’s archive for research. Her research explores the lives of the thousands of Jews from Germany who fled from National Socialist persecution between 1933 and 1940 to Fascist Italy. For the majority of these individuals Italy served as a temporary refuge, but a substantial number of Jewish refugees from Germany and other European countries remained in the country until the end of the Second World War. Following the Italian entry into WWII in 1940, they experienced internment, and, after the German occupation of Italy in September of 1943, they faced arrest and deportation to Auschwitz. That work is rooted in document deep dives in places such as the national archives in Rome, the Jewish Documentation Center in Milan, and regional archives in key cities that include Trieste, Turin, and Vicenza. And the Mandel Center fellowship at the U.S. Holocaust Museum opened more avenues. Materials from the International Tracing Service contain details on the fate of those sent to Nazi death camps. Film and video of survivor testimony, widely known as the “Spielberg Collection,” includes the experience of German-Jewish refugees in Italy. Alan Steinweis, the Ina Levine Invitational Senior Fellow during his semester in residence at the Holocaust Museum’s Mandel Center, concentrated on completing a book manuscript on the history of Nazi Germany for Cambridge University Press. Part of a series called New Interpretations in European History, the book is designed to be a foundational text for college courses, highly readable but solidly grounded in scholarship. As that broadly framed project came to a close, Steinweis also set out on the early stages of his work on a lesser-known chapter in the history of the Nazi regime. Steinweis is intrigued by the story of Georg Elser, a German cabinetmaker who came close to assassinating Hitler with a bomb hidden in a Munich beer hall in November 1939. Elser’s action has received much less attention than the failed attempt on Hitler’s life by German military officers in July 1944. In particular, Steinweis sees an opportunity for greater examination of the afterlife of Elser’s act and why it has remained relatively obscure while the Stauffenberg assassination attempt of 1944 is celebrated, the stuff of Hollywood movies. Reasons range, Steinweis suggests, from the timing of the two assassination attempts to post-war German politics. East Germans were reluctant to claim Elser because he wasn’t a communist; but for West Germans, he was too far to the left for embrace—a would-be hero lost in a no man’s land between ideologies. Academic year 2018-19 holds milestones for the university’s Carolyn and Leonard Miller Center for Holocaust Studies. After nine years as director, Professor Alan Steinweis stepped down from leadership as Jonathan Huener, associate professor of history, took on the directorship for the next year. And the center moved into new space this year with the re-opening of Billings Library, joining the Humanities Center, the Center for Research on Vermont, and Library Special Collections in UVM’s most beautiful building. With a director’s office, library/research space, a seminar room, an office for potential visiting scholars, and event space in the gracious common areas of the 1885 Billings Library, Huener hopes that this hub becomes a very busy place—for students, faculty, and the Vermont community.